Alien vs. Predator Trailer, Featurette & Posters! Apple has posted both the new teaser trailer and a featurette for Alien vs. Predator! You can check them out here and here! The sci-fi actioner, opening August 6, was written and is being directed by Paul W.S. Anderson and stars Sanaa Lathan, Raoul Bova, Lance Henriksen and Ewen Bremner. 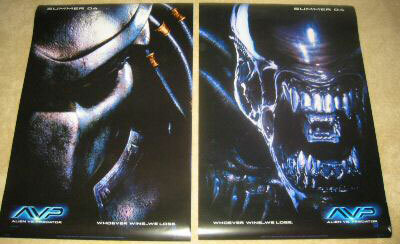 We also found the two new posters on eBay!